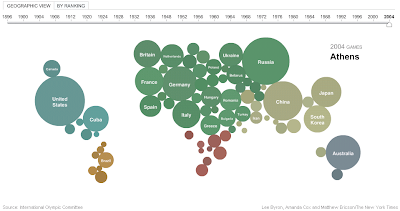 The NY Times have come up with a fascinating interactive map that you can play with to check out the medal counts by country for every Summer Games since the modern Olympic Games began in 1896. The size of the bubbles in the geographic view correlate to the number of medals won. Mouse over any bubble and the actual number of golds, silvers and bronzes won is displayed. Dragging the tab through all the years reveals historical blips. The massive Eastern Bloc showings for the 1980 and 1988 Games deflated in 1984 when they boycotted the Los Angeles Games. Also revealed is the emergence of Japan and more recently China in the international sports area over several decades. Lee Byron, Amanda Cox and Matthew Ericson compiled the map based on information from the International Olympic committee.